JUST WANT TO ADD A GAME OR TWO? Pick from our over 29 on-course games. You can have as many games as you like. 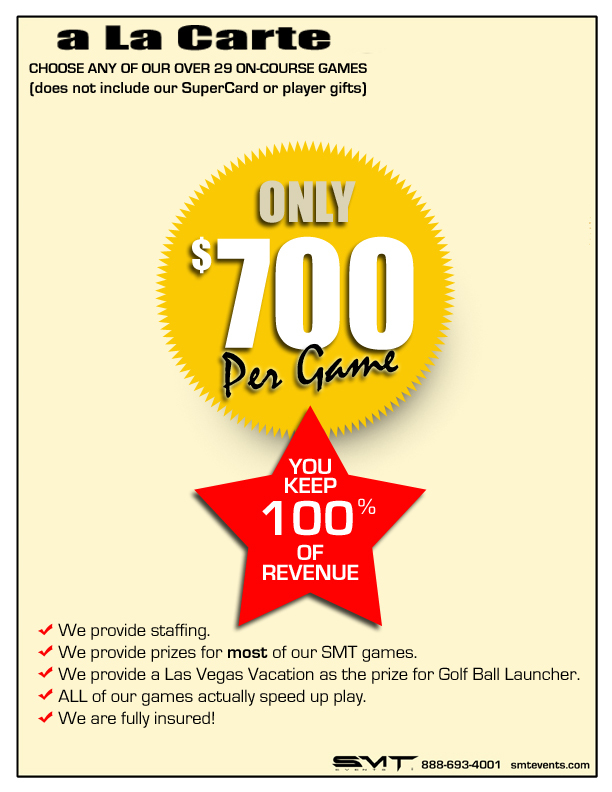 Your organization keeps 100% of the on-course revenue generated from the SMT games that you have chosen. This could be a significant income boost for your group, especially if your event secures sponsors for each game! We supply the employee to run the games you choose and we are responsible for the prizes for these games in most cases as well (ask for details). Of course, if you choose our Original Golf Ball Launcher, we bring a Las Vegas or Reno Nevada vacation stay of 3 days/2 nights for two people for the winner. All included in the $700 per game!